What a fantastic weekend we just shared together as we went Beyond the First Step. Make sure you continue on the trail by building upon knowledge you gained this weekend and spread it to your lodge, chapter, and unit. If you have any pictures of this past weekend, please send them to SectionW1N@Gmail.com. Please fill out this quick evaluation of this past weekend so that next year’s Council of Chiefs may take the feedback and implement it in the planning of the 2015 Section W-1N Conclave hosted by Section W-1N and the Mount Baker Council on April 24-26, 2015 at Camp Fire Mountain. 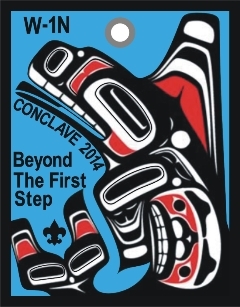 At the end of the evaluation form you’ll also be able to let us know if you’re interested in helping on staff at Conclave 2015. Click here to go to the online evaluation and staff interest form. If you didn’t get a chance to purchase an item from the Trading Post, you can still place an order online and we’ll ship it to your doorstep. Click here to go to the Online Trading Post. We look forward to serving you this upcoming year. If you have anything that you need of us as Section Officers, please feel free to email us. We are here to serve and support you.